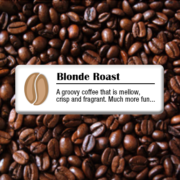 Below is a comprehensive list of coffee’s we roast and package locally. Buttery caramelized bananas with a hint of vanilla! Can you guess who the three bananas in the picture are? This coffee was grown from seedlings that originated from the Jamaica Blue Mountain region (JBM). It is a close match in taste to JBM. Intense concoction stirred up by the wicked troll witch of Avon. This is our better-tasting version of Jazzy Java and Jamaican Me Crazy. Why be crazy when you can be happy? Combines chopped pecan, ground cinnamon, packed brown sugar, and a variety of other surprises. Combines a medium roasted single origin of coffee with a dark roasted single origin of coffee. yoo.ho.yoo.ho….a cup of coffee for me!! NONE FOR YOU!! Our donut blend of coffee.